The history of Irish art starts around 3200 BC with Neolithic stone carvings at the Newgrange megalithic tomb, part of the Brú na Bóinne complex, County Meath. In early-Bronze Age Ireland there is evidence of Beaker culture and a widespread metalworking. Trade-links with Britain and Northern Europe introduced La Tène culture and Celtic art to Ireland by about 300 BC, but while these styles later changed or disappeared under the Roman subjugation, Ireland was left alone to develop Celtic designs: notably Celtic crosses, spiral designs, and the intricate interlaced patterns of Celtic knotwork. 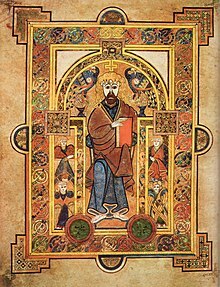 The Christianization of Ireland in the fifth century AD saw the establishment of monasteries, which acted as centres of scholarship, and led to the flowering of the Insular art style with its highly decorative illuminated manuscripts, metalwork and stonework (High crosses). From around 1200 to 1700, however, Irish art was relatively stagnant, and Irish culture was left comparatively untouched by the influence of Renaissance art. From the late 17th century, talented artists began to emerge in the fields of fine art, particularly the painting of portraiture and landscapes. The early 18th century saw increased prosperity and establishment of new cultural institutions including the Royal Dublin Society (1731) and Royal Irish Academy (1785). In the Victorian era, with a lack of patronage and better opportunities to be found abroad, many Irish artists emigrated to London (portraitists) or Paris (landscapists), which stifled the nascent indigenous scene. By the dawn of the 20th century, things began to improve. Opportunities began to spring up at home; the Celtic Revival movement saw a renewed interest in aspects of Celtic culture, Hugh Lane established the Municipal Gallery of Modern Art, the first public gallery of its kind in the world, and with increased patronage a new generation of homegrown talent and returning emigres gradually formed a solid basis for the regrowth of art in Ireland. The foundation of an independent Irish State in the early 1920s did not significantly alter the state of Ireland's visual arts; in the years following Independence, the arts establishment (exemplified by the committee of the Royal Hibernian Academy) was dominated by traditionalists who steadfastly opposed attempts to bring Irish art into line with contemporary European styles. Irish gold personal ornaments began to be produced within about 200 years either side of 2000 BC, especially in the thin crescent-shaped disks known as lunulae, which was probably first made in Ireland, where over eighty of the hundred odd known examples were found. A range of thin decorated gold discs, bands and plaques, often with pin-holes, were probably attached to clothing, and objects that appear to be earrings have also been found. By around 1400–1000 BC, heavier thin torcs and bangles have been found. The Late Bronze Age of 900–600 BC saw the peak of the surviving Irish prehistoric goldsmithing, with superbly worked pieces in simple but very sophisticated designs, notably in a type of dress-fastener that looks like a double-ended trumpet curved round so that the two bell mouths are roughly pointing in the same direction. There are also a series of grand gold collars, representing a development of the lunula, with round plates at either end, and a broad corrugated "U"-shaped body, decorated geometrically along the ridges and troughs of the corrugations. Goldwork all but disappears in the Iron Age, except for the late and enigmatic Broighter Hoard of the 1st century BC, which appears to mix local and Roman pieces. Although Ireland tends to be strongly associated in the popular mind with Celtic art, the early Continental style of Hallstatt style never reached Ireland, and the succeeding La Tène style reached Ireland very late, perhaps from about 300 BC, and has left relatively few remains, which are often described by art historians together with their British contemporaries as "Insular Celtic". Buried ironwork does not last long in Irish conditions, and gold is very rare, so the survivals are normally in bronze. The Petrie Crown, Loughnashade Trumpet and a series of discs whose function is mysterious are among the most striking pieces. The decoration on a number of bronze scabbards, many found in the River Bann, have inspired much discussion, as they seem close to other pieces from as far away as Hungary, and the possibility of an immigrant master has been raised. The National Museum of Ireland in Dublin holds the majority of major finds from the whole prehistoric period, with others in the Ulster Museum in Belfast and the British Museum in London. In Ireland, "La Tène ornamented material from the third to fifth centuries AD is difficult to demonstrate [from Ireland]". In the 6th to 8th centuries the art of the newly Christianised Irish mixed with Mediterranean and Germanic traditions through Irish missionary contacts with the Anglo-Saxons, creating what is called Insular art (or the Hiberno-Saxon style) and such masterpieces as the Book of Kells, the Ardagh Chalice and the Tara Brooch, the most spectacular of about fifty elaborate Celtic brooches in precious metal that have been found. The stone high cross was a distinctive insular type of monument, of which many examples survive. Later in the period, Scandinavian influences were added through the Vikings. These earlier styles largely came to an end with the Norman invasion of 1169–1170 and the subsequent wide adoption of Romanesque art. Through the Gothic and Renaissance periods Irish art was essentially a regional variation of wider European styles, with many works imported from England or further afield, and some English artists and craftsmen active in Ireland. Many objects of a distinctively Irish form from the first millennium, such as bell or book shrine reliquaries, were renovated or repaired in the contemporary style. Cupid and Psyche in the nuptial bower by Hugh Douglas Hamilton, who trained in Dublin under Robert West. Oil, 1792-93. The visual arts were slow to develop in Early Modern Ireland, due to political disruption, and the lack of patrons in either government, the church, and wealthy resident landowners or business class interested in art. Yet beginning in the late 17th century, Irish painting began to develop, especially in portraiture and landscape painting. These painters typically looked outside Ireland for influence, training and clients who were wealthy enough to afford the purchase of art. For example, Walter Frederick Osborne developed his open air painting in France whereas Sir William Orpen studied in London. However, what is now the National College of Art and Design in Dublin has existed since founded as the Dublin Art School in 1746. Its founder Robert West had studied drawing and painting at the French Academy under François Boucher and Jean-Baptiste van Loo. In the second half of the 19th century a climate of cultural resurgence and nationalist ideals contributed to the development of an Irish style. A revived interest in the Irish language and Celtic history prompted a revival in the Irish visual arts as well. Belfast born Sir John Lavery may be the most internationally known painter of this generation. He trained in Glasgow and France, but unlike Orpen, maintained close ties to his native land. In 1928 he was commissioned to paint the symbol of Éire which would be used as the central image on the bank note of the new Irish Free State. Other paintings embodied the call for independence, such as Beatrice Elvery's Éire of 1907 which depicts the history of Irish Catholicism with the still-nascent Irish Republic. Early Irish masters include: Garret Morphey, Robert Carver, George Barrett, Sr., James Barry, Hugh Douglas Hamilton. The Irish impressionists included Roderic O'Conor and Walter Osborne, with other landscape artists: Augustus Nicholas Burke, Susanna Drury, Paul Henry, Nick Miller, and Pat Harris. Notable Irish sculptors have included Jerome Connor, John Henry Foley, Augustus Saint-Gaudens (born in Dublin, but emigrated to America at six months old), Mary Redmond, John Behan and Oliver Sheppard. Edward Delaney, Rachel Joynt, and Rowan Gillespie are contemporary sculptors. Harry Clarke, Sarah Purser and Evie Hone worked in stained glass. Portraitists have included Daniel Maclise, John Lavery, William Orpen (both these War Artists in WWI), John Butler Yeats (father of Jack and William Butler), and Henry Jones Thaddeus. Apart from Francis Bacon, who left Ireland as a young man, the best-known 20th-century Irish artist was Jack Yeats, brother of the poet, also with an individual style that is hard to classify. The art of Seán Keating was poised between Social Realism and Romanticism, and addressed public and political themes in an emerging nation. Ireland's best known living artists include Brian O'Doherty an art historian, sculptor, and conceptual artist who is based in New York City, Sean Scully an abstract painter who lives and works in New York City, Dorothy Cross, a sculptor and filmmaker and James Coleman, an installation and video artist. Robert Ballagh, Willie Doherty, and Sean Hillen also work in modern media. Interest in collecting Irish art has expanded rapidly with the economic expansion of the country, primarily focussing on investment in early twentieth century painters. Support for young Irish artists is still relatively minor compared to their European counterparts, as the Arts Council's focus has been on improving infrastructure and professionalism in venues. An exhibition called 'The Art of a Nation: Irish Works from the Allied Irish Bank and Crawford Art Gallery Collection' was held between 13–31 May 2015 at the Mall Galleries, The Mall, London. It celebrated the story of Irish art from 1890s to the present day and included important works by Aloysius O'Kelly, Sir William Orpen, Jack B Yeats, William Scott, Sean Scully and Hughie O'Donoghue. Admission to the exhibition was free and a fully illustrated catalogue was for sale. Kevin Abosch, Gerard Byrne, Dorothy Cross, James Coleman, Amanda Coogan, Colin Davidson, Joe Dunne, Ross Eccles, Fergus Feehily, Gary Farrelly, Ronan Goti, James Hanley, Gottfried Helnwein, Sean Hillen, Mary Fitzgerald, Stephen Lawlor, John Long, Paul McCloskey, Mick O'Dea, Nick Miller, Michael Mulcahy, Rasher, Peter Richards, Anne Rigney, Victor Sloan, Paul Seawright, Samuel Walsh, Conor Walton. Northern Ireland has a significant tradition of political mural painting, from both the loyalist and republican standpoints. ^ "Irish Artists: 18th Century: Robert West". Encyclopedia of Irish & World Art: 2010. visual-arts-cork.com. ^  Steward, James Christian. The Irishness of Irish Painting. Retrieved Nov. 15, 2007. Kevin Samuel Murphy (1969) Irish artist born in London, England. Treasures of early Irish art, 1500 B.C. to 1500 A.D.: from the collections of the National Museum of Ireland, Royal Irish Academy, Trinity College, Dublin. New York: The Metropolitan Museum of Art. 1977. ISBN 9780870991646.
www.modernart.ie Irish Museum of Modern Art. This page was last edited on 31 January 2019, at 15:29 (UTC).